RECORDING, MIXING, MASTERING IN A A PROFESSIONNAL RECORDING STUDIO "
Capturing the sound of the clarinet, the organ and the synthesizers - Creating a CD - Encoding on MP3 PRO or RealAudio - BACH's Sacred music recorded with computer-controlled synthesizer. If the concert is the best way of approaching music, the CD allows us to prolong the emotion of evening, and also to discover new styles and new artists. A studio includes a recording room, a small separate room for the drum kit or any instrument which needs to be isolated, and a mixing booth. These premises will have benefited from an acoustic treatment intended to give the most beautiful sound possible : neither too glossy nor too matt and ideally round and warm. A variety of materials such as wood, stone, cork, carpets and rockwool will give this space the correct reverberation. The bass will be clear without obstructing the sound space. For that "bass traps" big boards fitted to the ceiling and covered with rockwool allow the best sound quality. Numerous architects specialise in the building of studios, to achieve stunning acoustic performances without sacrificing the aesthetics. The studio includes a recording room, a small separate room for the drum kit or any instrument which needs to be isolated, and a mixing booth. In the recording room are the musical instruments, microphones, stands, connecting cables, monitor headphones etc. On the baseboards, 220 V electrical sockets, and XLR boxes connected to the recording console by miles of cables. The central nervous system of the studio : an assortment of high-tech instruments : dispatching console, amplis, monitors, track-recorders, Dat, autolocators, computers, amplifiers and monitors, and stacked in their system stands, reverbs, echos and digital delays, noise-gates, phasers, flangers, harmonisers, equalisers, enhancers, compressors, too many to remember. Today almost all recordings are made by the technique of multiple tracks on one tape - tape recorders ( analogue ), digital recorders or directly onto computer (Mac rather than PC) all are the same in terms of understanding the functioning of the system. It allows direct recording, tracking (copying one track to another) and re-recording (recording musicians at the same time as they listen to that which has already been recorded on the tape). Sounds distributed on separate tracks will then be mixed. For reasons of cost and convenience, the computer takes the track bit by bit from the analogical track-recorder. Digital sound doesn't have the "breath" of tape, and although it possesses wider dynamics, it remains less fine and less "warm" than analogue sound. Americans are now returning to analogue equipment, particularly for instruments such as the clarinet. How to combine these two techniques ? In the heart of studio, there is a console. It manages the recording operations and also tracking and mixing. It must have at least as many channels as the recorder has tracks, in order to be able to mix them. These amplified signals are listened on the monitors during the recording or the mixing. These are reverbs and digital delays, equalisers, compressors, phasers, flangers etc. which "embellish" the sound in the mix or to give it a colour or a particular density. Sound generated with synthesizers or captured by the microphones arrives in the form of a signal at the inputs of the console. Modulated as close as possible to 0db so as not to lose the "gain" (dynamics) or to distort, it will then be assigned to a track on the computer or the track-recorder. The system of recording and simultaneous playing (simul-sync) to and from the recorder allows the re-recording and the distribution of the orchestration, instrument by instrument, to the various tracks. The sounds which are stored on the multitrack or on the computer, need to be optimized, mixed, balanced, and reduced down to two signals which are sent to the right and left primary outputs of the console. These mixed signals, recorded on a digital stereo DAT machine will be used to create the "master for edit" of the disc. - the equalisation modifies the frequencies, by correcting low, medium and high. - The auxiliaries allow the input of different effects : for example, reverb will prolong sound as if it had been recorded in the vault of a cathedral. 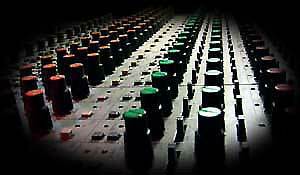 - Faders adjust the balance of instruments. When all the instruments have been recorded, each of them on one (or two for Stereo) different tracks, it is useful to "clean" the "whites" on the tracks. Afterwards, only the mixing remains, to create the "master for edit". This, compiled to computer and processed by a sound editing software, will give the definitive master. This last will be sent to the CD factory to be fabricated. This is the simplest step because the instruments are recorded by "direct input", which is by plugging directly into the console, without going via a microphone. It is enough to simply adjust the Recording level gauge to 0 Db. In this stage, it is not recommended to add in reverb or equalise the sound. Indeed, experience suggests not removing the possibility of future frequency corrections at this stage. Corrections will be made in the mix. With a portable console and a stereo Neumann condenser microphone, it is possible to realize a magnificent church organ's recording. When you think you have found the place where you can really hear the instrument, you stretch out acoustic shrouds around this place and put a single stereo microphone in the axis, in front of the organ. Here we enter a more sophisticated domain. We incline two Neumann condenser microphones to about 20 cms above the keys of the medium body, on both sides the clarinet. A stereo Neumann condenser microphone at about 70cm-1m from the bell. This configuration gives a detailed, precise and warm sound. Listening to the instrument will allow one to define the place where the sound emission is at its most beautiful and to adjust the location of microphones. A phase-metre is indispensable to avoid the inversion of phase, difficult to master in this type of recording. An excellent acoustic guitar's sound recording will be realized by simply placing a stereo Neumann condenser microphone, or better still, a Royer stereo ribbon microphone in front of the sound hole. A little delay and reverberation in the mixing will provide the best effect. Mixing is sent to the DAT tape. A DAT (Digital Audio Tape) is a digital (two tracks) tape recorder which will supply the "master for edit", almost-definitive version. This will be transferred into sound editing software to be "cleaned" of the last imperfections and set up definitively (noises before and after the piece, editing inside the piece, fade in, fade out etc...), ending with the realization of the definitive master. It is from professional copies of this master that theCD will be burned. For example, the fabrication of Jean-Christian MICHEL's CD were realized in this fashion by a CD manufacturing plant : theCD are engraved and put into the boxes with their jackets to be ready to be sold. A little word in passing about MP3 PRO. This new type of compression combines the algorithm of MP3, well known by the Internet users, with "Spectral Band Replication" (SBR) technology which permits the restoration of frequencies between 13-15.000 Hz and consequently allows a sound compression of greater quality. The encoding from Wave format (as with an audio CD) in the RealAudio format has been done with Real Networks' Helix Producer. Modern music makes considerable use of electronics and data processing. Computer Assisted Music is defined by the abbreviation CAM. - MIDI software packages (Cubase, Cakewalk, Big Boss), high quality sequencers which allow synthesizers "to play" a score by using the MIDI interface. - "Integrated" software packages , which include both functions, MIDI and Wave (Cubase SX or VST, Nuendo, Digital Performer, Pro Tools, Sonar XL, Logic Audio). 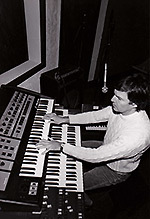 Computers and synthesizers do not "dehumanize" music and do not in any way damage its soul. On the contrary, they allow the creator to draw new sounds, to leave more open the route for his imagination when developing masterful orchestrations. Computers will never "replace" man, because it is always he who is behind the machine, who dictates its program and gives it orders. Music software simply allows the irreproachable execution of its scores, henceforth transformed into "MIDI files". Be reassured, the technique is there only to serve culture, imagination and the dreams of the musician. Who would have thought that one day, JS BACH's Sacred Music would be played on the clarinet, the organ and by Computer Assisted Music ! Jean-Christian MICHEL worked with great sound engineers such as Francis Miannay, Jacques Lubin and Gerhardt Lehner at the Barclay studios in Paris, Jean-Claude Egreteau at CBS studio, and Mike Sharp in Los Angeles in the USA... Jean-Christian Michel manages his own professional recording studio, and has considered useful to propose some elements of reference to those who would like to get their own HOME studio, or to have an additional lighting to realize certain specialized sound recordings (as the sound recording of clarinet, for example).